Heard of www.goodreads.com? I’m giving away a beautiful hardback book! More about that in a bit. 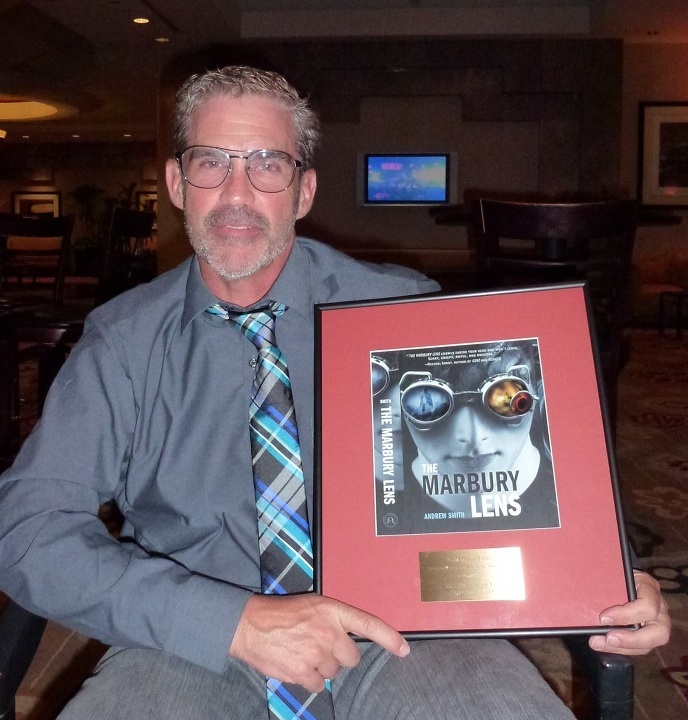 Last night, at the Long Beach Hilton, I was one of the authors invited to the SCIBA Awards dinner. I think I was the only debut author who didn’t have a published book out yet. It was wonderful getting to meet these heroes who manage to get books in the hands of kids and young adults and show them how much fun reading is. There were writers, teachers, booksellers, book reps and at least one publicist. 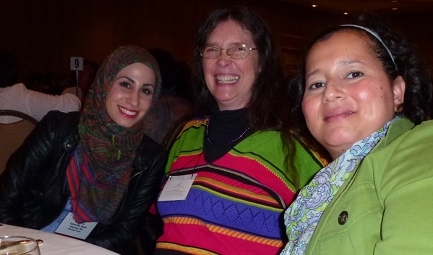 The fabulous and fun Tahereh Mafi (link below) of SHATTERED sat at my first table. Next to her is Kris from the delightful Once Upon A Time Children’s Bookstore in Montrose, Ca, and in green, representing one of my favorite job categories, a school librarian. Look, my book cover! The Southern California Independent Booksellers Association put together a wonderful presentation and introduced each author. For someone whose first book isn’t coming until March 2012, this was a big thrill. After we moved tables between the salad and entree courses (do I take my napkin? My water? ), we then went to the signing tables (which they numbered exactly the same as the banquet tables). Our wonderful Random House sales rep, Erin, gathered up books for us while John Stephens and I signed (I signed chapter samples). 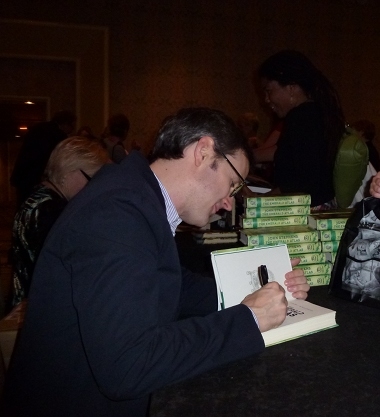 His book, THE EMERALD ATLAS, is a middle grade book that I can’t wait to read. I’ve heard it is wonderful, the kind of book that appeals to readers of Pullman and Rowling. It was a big deal for RH to get this book and he has toured extensively with it, to hoards of happy readers. He’s also an incredibly nice and funny guy. At the end of the evening, I met up with Andrew Smith, the winner of the award for Best Children’s Book (which sounds misleading because it is a mature YA book). He was sitting at my table earlier and when I congratulated him on the nomination, he was sure he wasn’t going to win. Joke is on you, Andrew! You can see, he’s still in a blissful state of shock here. I’m partway through THE MARBURY LENS and it is wonderful writing, the kind that comes from the gut, draws you in and doesn’t let you go. He was signing his new book, STICK. So, the GIVEAWAY! 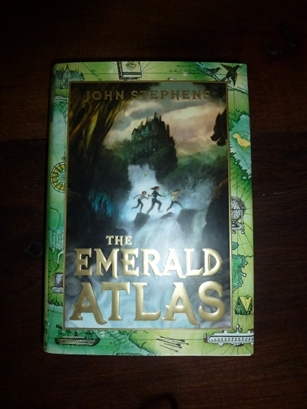 I managed to snag an extra signed copy of THE EMERALD ATLAS to give away to a lucky reader. If you could see this book in person, you’d just want to pet the cover it’s so pretty. Inside, they printed it with the pricey deckle edge pages that always makes me happy there are still real books to hold. All you have to do is follow the GOODREADS link that is to the upper right (“vote here”). If you put in a vote for my book on any of the seven lists I am on, you’ll be entered. The more lists you vote for, the better your odds of winning. Also, if you mark STARTERS as “to-be read” (try clicking on the book icon), that’s another entry. All this helps me get word of the book out there. So even if you don’t want the prize, thank you for any help. I’ll run this giveaway until the end of November. US only please. Good luck! links: http://www.taherehmafi.com/ Her book, SHATTERED, (lots of buzz) has exciting promotions going on now, so check out her site. http://www.shoponceuponatime.com/ The charming Montrose, CA bookstore! Sounds like a fantastic night, Lissa! I had to laugh at the snippet of confusion when you switched tables… do I take my napkin? My water? Was this your first signing? It really was odd. But the worst was that the instructions made it sound like the third switch, for dessert, was just like the other round banquet tables. I’ve never done this before and so was sitting at the round table 17 talking to the terrific Book Soup Bookstore guys, not knowing that a rectangular table 17 was on the far side of the ballroom, waiting for me. Yes, first signing ever. I signed the first one on the cover. Sigh. Sounds like an amazing evening! With all the dinners, awards and PR, I hope you still have time to write! 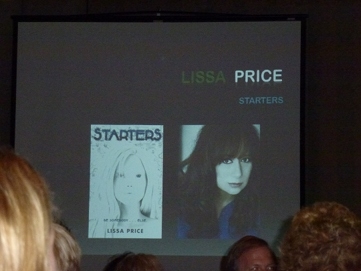 Way to go Lissa… I just pre-ordered my copy of STARTERS from my bookstore. My goal is to get back to California next year to get it signed! I love that goal because it would be great to see you all. Just don’t come in March, when I’ll be touring. Or June 4-8, July 10-14, or 25-28. Or first week in Aug. Thank you for your words of support, it means so much to me.